This 300 piece floor puzzle is highly detailed and challenging kids and families to learn the different species of Butterfly that inhabit our world. Each puzzle creates a learning environment that includes 36 different butterflies and a chart on the inside of the box, which lists each animal’s name in multiple languages. Perfect for children ages 8+. All Crocodile Creek's puzzles are printed with soy-based ink on recycled cardboard, and conform to or exceed both U.S. and European safety standards. This 100 piece floor puzzle is challenging and fun for kids to learn the different species of Repti.. 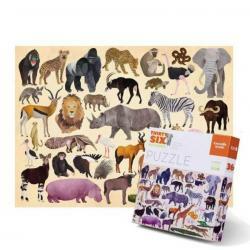 This 300 piece floor puzzle is highly detailed and challenging kids and families to learn the diffe..